FREE custom imprint on 6 or more! The price for 6+ is the same as our standard ChargeHub. Click here to order a ChargeHub with your custom logo/imprint. The ChargeHub® X7 is a 7-port USB Charging Station that can solve the demands of charging multiple devices safely and efficiently. Just plug the hub into a wall outlet and you can charge up to 7 devices at once. Patented SmartSpeed Technology provides an optimal charge up to 2.4 amps per port. 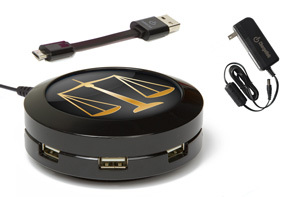 It is compatible with virtually any USB chargeable device – Apple, Android, or any other USB device! Use the convenient USB Charging Cable included with the ChargeHub or use your personal cables. It is perfect for the office, deposition suite or on the road! An exciting feature of the ChargeHub X7 Super Value Pack is its portable capabilities, utilizing the included Vehicle Power Cable that can be used at home or work, as well as on-the-go, including use in cars, trucks, RV’s, boats and most airplanes! Price Each. The ChargeHub is not a portable battery charger. It must be plugged in to function. The ChargeHub® X7 is a 7-port USB Charging Station that can solve the demands of charging multiple devices safely and efficiently. Just plug the hub into a wall outlet and you can charge up to 7 devices at once. Patented SmartSpeed Technology provides an optimal charge up to 2.4 amps per port. It is compatible with virtually any USB chargeable device – Apple, Android, or any other USB device! Use the convenient USB Charging Cable included with the ChargeHub or use your personal cables. 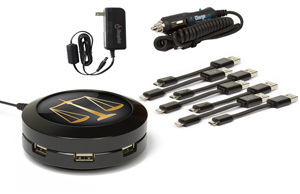 It is perfect for the office, deposition suite or on the road! Price Each. The ChargeHub® X5 is a 5-port USB Charging Station that can solve the demands of charging multiple devices safely and efficiently. Just plug the hub into a wall outlet and you can charge up to 5 devices at once. Patented SmartSpeed Technology provides an optimal charge up to 2.4 amps per port. 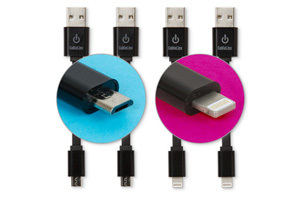 It is compatible with virtually any USB chargeable device – Apple, Android, or any other USB device! 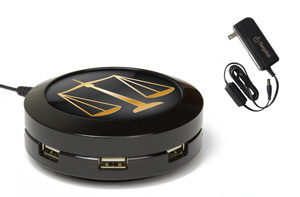 It is perfect for the office, deposition suite or on the road! CABLES NOT INCLUDED. Price Each. 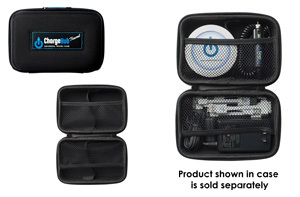 The Travel & Storage Case for ChargeHub is a universal travel case that includes 2 dividers, and is excellent storage for on-the-go charging needs. It can fit (1) ChargeHub, (1) Power Supply, (1) Vehicle Power Cable, as well as a variety of USB charging cables. The sleek design with a zipper closure and blue stitching is a must for all your traveling needs!